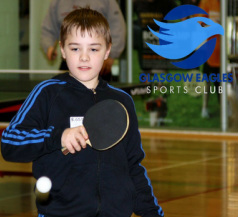 ﻿Table Tennis is one of many sports opportunities offered by the Glasgow Eagles Sports Club. It is fun, easy to follow and offers a sense of achievement - from being a beginner to an open champion. It helps build coordination, ball control, confidence, sharing, health and safety skills no matter what a persons ability is. Contact Table Tennis Coach Shaf Ali on 0750537752 For further information.